In August 1998 I visited a late 19th century fortress 'Fort Vuren' which was once part of the defense system New Dutch Waterlinie, meant to defend the Northern part of Holland, in particular the city Gorinchem. This fortress was never used in battle and is now sometimes used to house art exhibitions. During such an exhibition they played music that overwhelmed me. The cold and very damp fortress (with feet-thick concrete walls below ground level) with its church-like acoustics together with the music melted into an almost eerie experience. I thought I heard an album by Enigma. 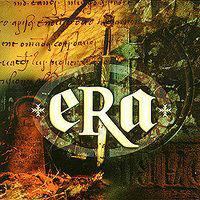 But it turned out to be an album called 'ERA' by the French composer and guitarist Eric Levi. The music is a weird mix of Gregorian chant (performed by the English Chamber Choir), rock and disco. Musicians are Lee Sklar, Chester Thompson, Philippe Manca, Neal Wilkinson, Patrice Tison and Eric Levi. I only recognize Chester Thompson who always played drums with Phil Collins when Genesis was on tour. Parts of the album remind me of the Carmina Burana by Carl Orff, other parts seem inspired by early works of Mike Oldfield. Beating on the sound of a rhythm, the Cathar rhythm. Based on this verse and the enormous encyclopedia the Internet has turned into, it is fairly easy to do research. At the start of the 13th century Catholicism reigned supreme but a number of Christian diversions where popular. The acts of Pope Innocentius III made large amounts of people hostile towards Catholicism because it seemed that Church did present Rome instead of faith. A fertile environment for heresies, one of these was Catharism, of which the largest group formed in the South of France, in the Languedoc area near Toulouse. Catharism preached that the body is evil but that one's soul is devine and therefor must be set free. During the 13th century the Inquisition and Crusades controlled from Rome eradicated the Cathars. 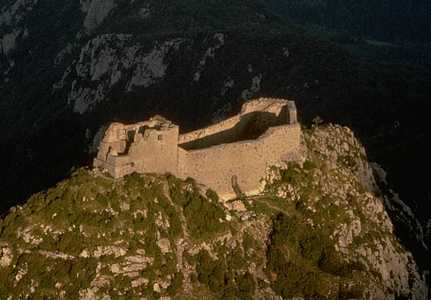 Montsegur (Mont Segur = Safe Mountain) was one of the last Cathar bastions to fall when (after a siege of 10 months) the Cathars on Montsegur were given 14 days to surrender. They had the option to deny their faith or be killed. Almost all choose to keep faith so 205 men and women were burned at the stake on March 15th 1244. There is a lot of mystery about the Cathars and Montsegur. On July 21st the sunrays enter and leave the ruins through four openings. Did the Cathars have some solarian rites? "Montségur's fall is the symbol of the Cathar defeat, and the end of the Cathar clergy." The end of an ERA which I think this album is telling us. The Latin sung in most of the songs is fake. It sounds great though. It is believed the Cathars had their own secret script. So the 'fake' Latin is either Eric Levi making fun at Latin, the language of Rome, or maybe it refers to this secret script. There appears to be at least two different versions of the album, the difference being the inclusion of the track 'Enae Volare'. If you legally own the album you can get the MP3 compressed files here (inclusive 'Enae Volare'). When this page has completed loading, you should be hearing the track 'AMENO' when your browser supports playing MIDI. If not, dowload it here.